For the third time in the last four Julys, the Phillies did not make a trade in the days or hours leading up to Major League Baseball’s trade deadline, the sport’s unofficial midsummer holiday for contending teams and sellers alike. But unlike in both 2013 and 2014, when a team that hadn’t yet committed to a rebuild stood pat, the 2016 trade deadline was the first run by Matt Klentak, the general manager hired to replace Ruben Amaro Jr. in October. With a revamped farm system and no obvious All-Star type talent to deal, Klentak didn’t feel like he was forced to make a move. And so he did not, much to the surprise of the industry. Barring a trade through waivers next month – how the Phillies sent Chase Utley to the Los Angeles Dodgers last August, and how the team shipped right-hander Roberto Hernandez to the Dodgers for two prospects a week after the deadline two years ago – Jeremy Hellickson will be finishing the 2016 season in a Phillies uniform. Although he is not the Cole Hamels-type that would net a bounty of prospects, Hellickson was expected to be traded prior to the arrival of Monday’s 4 p.m. deadline simply because he’s a 29-year-old, free agent-to-be who has had a lot of success in the last 2 1/2 months. Hellickson, who has a 2.27 ERA in his last seven starts (and 3.70 ERA overall), was scouted by the likes of the Baltimore Orioles, Miami Marlins, Detroit Tigers, San Francisco Giants, and Toronto Blue Jays in recent weeks and could have been an upgrade to the bottom half of the rotations of many a contending team for the season’s final two months. Instead, he’s likely to stick around as easily the most veteran member of the Phillies rotation. As noted earlier, the Phillies can still try to trade veterans like Hellickson (and catcher Carlos Ruiz, outfielder Peter Bourjos, relievers Jeanmar Gomez and David Hernandez) in the next month. Players can switch teams and be be eligible for postseason rosters through waiver trades prior to Sept. 1. But those trade are more complicated (a player has to clear waivers first, or, if he is claimed, you have to work a deal out with the claiming team or pull him back). Still, sometimes they work: two years ago, the Phils sent Hernandez to the Dodgers for right-handed prospect Victor Arano (thriving as a reliever at Class A Clearwater this year) and infielder Jesmuel Valentin (promoted to Triple-A Lehigh Valley last week). That trade is probably an exception, however. In Hellickson’s case, the Phillies decided that whatever prospect(s) interested teams were offering on Monday were not better than the compensation pick they hope to receive if he signs elsewhere as a free agent this winter … or the value Hellickson continues to have as a dependable-if-not-dazzling veteran in an otherwise youthful and impressionable rotation. During a conference call with reporters following Monday’s deadline, Klentak mentioned the idea of trying to find “an appropriate balance” between the present and the future several times. The decision made by Klentak (and the rest of the Phillies front office), at least in Hellickson’s case, was a risky one. The Phils can only recoup a compensatory draft pick for a departing free agent like Hellickson, under the current rules, if they tender him a qualifying offer after he becomes a free agent after the World Series. As we explained earlier today, while the odds are that Hellickson and his agent, Scott Boras, will be able to score a multi-year deal on the open market that’s richer than the $16.7 million, one-year qualifying offer, there’s no certainty that takes place. If Hellickson pitches poorly in the season’s final two months, he could accept the qualifying offer and return to the Phillies rotation in 2017. Boras client and Baltimore catcher Matt Wieters accepted his own qualifying offer last winter. “We’ve got several months before we have to make that decision on Jeremy or any player (and) I think it would be unwise of us to commit this soon,” Klentak said of the likelihood of extending Hellickson a qualifying offer, the only way they’ll receive anything for him if he does depart as a free agent. With no future salary commitments after 2016 (other than Ryan Howard’s $10 million buyout and whatever they’ll owe Matt Harrison, as injured pitcher whose salary is insured), the Phillies, at least financially, can afford the risk that Hellickson would accept a qualifying offer. They could still value Hellickson’s presence in the 2017 rotation. A worse scenario: Hellickson gets injured in the season’s final two months and the team decides not to issue him a qualifying offer. And then there’s this: even on an unattractive free agent market, Hellickson becomes a less attractive option for teams if the Phils make him a qualifying offer, because a team that signs him has to forfeit their first-round pick (as long as they don’t own one of the top 10 picks in the June 2017 draft). Klentak obviously understood all of this as he entered the trade deadline and there is a chance some of the current rules could change when the MLB Collective Bargaining Agreement expires on Dec. 1. But in a trade market when all but three teams made at least one deal leading up to the deadline, and when contending teams were obviously in the hunt for pitching (the Toronto Blue Jays acquired struggling Pittsburgh left-hander Francisco Liriano just before 4 p.m.), it was more than a little surprising that the Phillies could not receive something acceptable in return for a useful piece like Hellickson. Is it possible they overvalued him on the open market? “We value what Jeremy brings to this team,” Klentak said. “More than any other reason, the reason that we acquired Jeremy Hellickson last off-season was to do what he’s done for the first four months of the year: to bring stability to the rotation and be a mentor to our young pitchers. He’s been outstanding in that role. In the short term, this is what Hellickson does to the Phillies organization: his presence almost certainly prevents the promotion of right-hander Jake Thompson. The 22-year-old Thompson, acquired a year ago on Monday in the Cole Hamels’ trade, has a 1.21 ERA in his last 11 games at Triple-A Lehigh Valley. But with young pitchers on the major league roster with workloads that will continue to be monitored in the season’s last two months, there could still be opportunity for Thompson. Klentak said the trade deadline, whether the Phillies made moves or not, would not affect the timeline on any of their prospects. Thompson, outfielder Nick Williams and shortstop J.P. Crawford could all still arrive at some point in 2016. 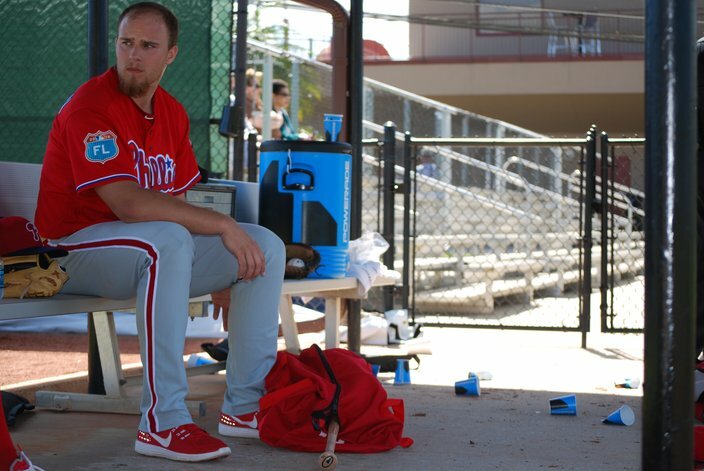 Phillies prospect Jake Thompson, a favorite to be promoted if Hellickson was traded, will have to wait instead. Thompson has a 1.21 ERA in his last 11 starts at Triple-A Lehigh Valley. The Phillies can also create roster flexibility if they are able to move veterans in the aforementioned waiver trades in August. But if the Phillies continue to value those veterans as they did on Monday, that’s surely not a certainty. “I would say that at this juncture I have a pretty good feel when our players may get claimed when we ultimately put them on waivers in August,” Klentak said. “I have a good sense of which players were popular and which were not. But we’ll see. It is a little more complicated to make a trade in August. “One of the reasons we didn’t make a trade prior to today (is that) we’re not under economic pressure to send money out the door and we’re not looking to just dump veterans for the sake of dumping veterans. That’s not the business we are in. I’m cognizant of what our record is this year.